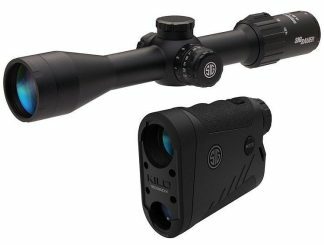 SIG Sauer Sierra 3 BDX Rifle Scope Always in Stock at the Best Price! 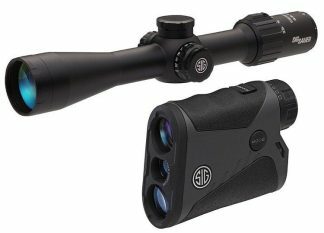 SIG Sauer Sierra 3 BDX SIERRA3BDX Rifle Scope Systems on Sale: SIG BDX SIERRA3BDX 3.5-10X42 MM, SIG BDX SIERRA3BDX 4.5-14X44 MM, SIG BDX SIERRA3BDX 4.5-14X50 MM, SIG BDX SIERRA3BDX 6.5-20X52 MM, SIG BDX COMBO KIT, KILO1400 – SIERRA3 3.5-10X42, SIG BDX COMBO KIT, KILO1800 – SIERRA3 4.5-14X44MM, SIG BDX COMBO KIT, KILO2400 – SIERRA3 6.5-20X52MM. 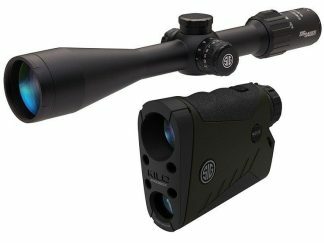 The SIG Sauer Sierra 3 BDX Ballistic Rifle Scope by SIG SAUER’s Electro-Optics makes hunting extremely easy with the simple to use SIG BDX Ballistic Data Xchange Riflescope System. Simply download the SIG BDX App, Set up your profiles in the app including your location, ammunition type and Rifle. Once your profiles have been set, then you apple or android device will communicate to the The KILO BDX rangefinder and the BDX Riflescope. The KILO BDX rangefinder communicates your ballistics via Bluetooth® and will illuminate the exact holdover dot in the reticle of the SIG BDX SIERRA3BDX Riflescope. Make every shot count with the New SIG BDX Ballistic Data Xchange Riflescope up to 800 yards! Shop more SIG Sauer KILO BDX Range Finders on Sale! Xtreme Guns and Ammo in Richmond Texas carries the full line of SIG Sauer Sierra 3 BDX Rifle Scopes for Hunting, Tactical and Long Range applications. We also offer package deals on Sig Sauer Rifle and Scope Purchases. Feel free to call XGA with all your SIG Sauer Sierra 3 BDX Ballistic Data Xchange Rifle Scope Questions, at 832-363-3783 or chat with us online during regular chat hours.Shop More SIG Sauer Riflescopes at Huge Discount Pricing online!